In January 2015, a large area of open fields were set ablaze in the Boland and Overberg regions, resulting in widespread devastation of ecology in the Hottentots Holland Biosphere. Firefighters were attending to the blazes for more than a week, and winds were not assisting the extinguishing thereof. 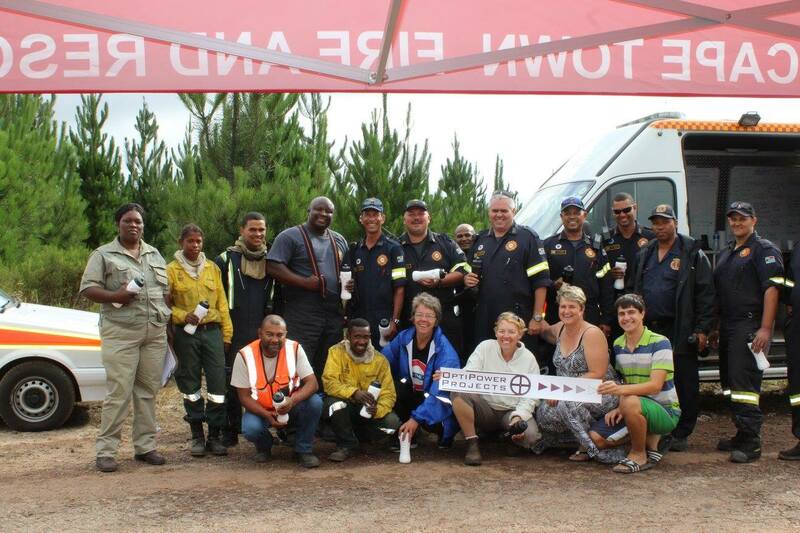 OptiPower Projects, together with Pick n Pay Gordon’s Bay, HelderbergCONNECT and BP Grabouw, put donations and food hampers together for the Firefighting teams in the Grabouw side of the wildfires. As food stockpiles ran low, these companies arrived in time to restock. OptiPower Projects donate 50 bottles of purified water and chocolates for the fire marshals. Joining the donation party was Pick n Pay Gordon’s Bay, who had sponsored 50 hotdog rolls and sausages, and BP Grabouw, who without any question, donated numerous cold drinks and ice to quench the thirst of the fire marshals. HelderbergCONNECT had organised the initiative. OptiPower Projects wishes to extend its thanks to each and every fire marshal, every volunteer and every person involved with the extinguishing of a major wildfire which destroyed hectares of land in the Hottentots Holland Mountain Nature Reserve.